They’re HERE!!!! The Hatch chiles have arrived!!!!! And yes, I am VERY excited about it!!! So what makes Hatch chiles so special? I suppose every Hatch chile fan has their own reasons but to me, Hatch chiles are meaty, earthy and have a more rounded flavor than any other green chile – and they blow anything canned right out of the water! This year, I sadly exhausted my supply of frozen chiles rather early :-(. Fortunately, Melissa’s Produce was kind enough to send me some freshly roasted Hatch chiles and a bag of dried ones as well a couple of weeks ago. 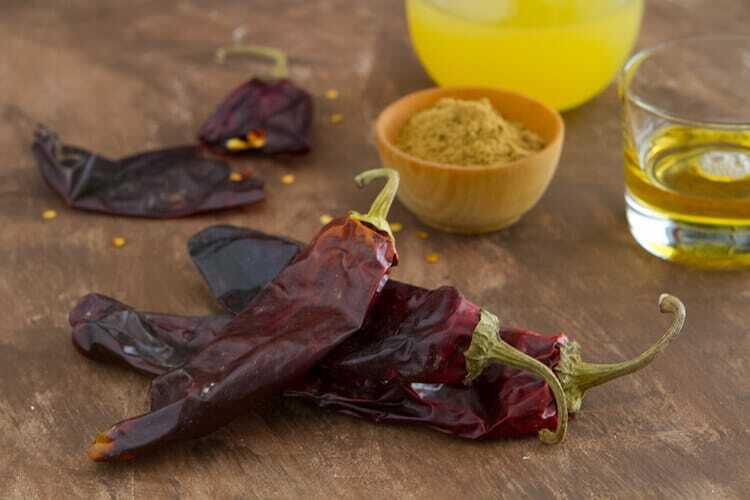 So of course, I had to cook with them – and so I have Hatch chiles for you today two ways… because one way simply isn’t enough to celebrate the arrival of these chiles! First up…. 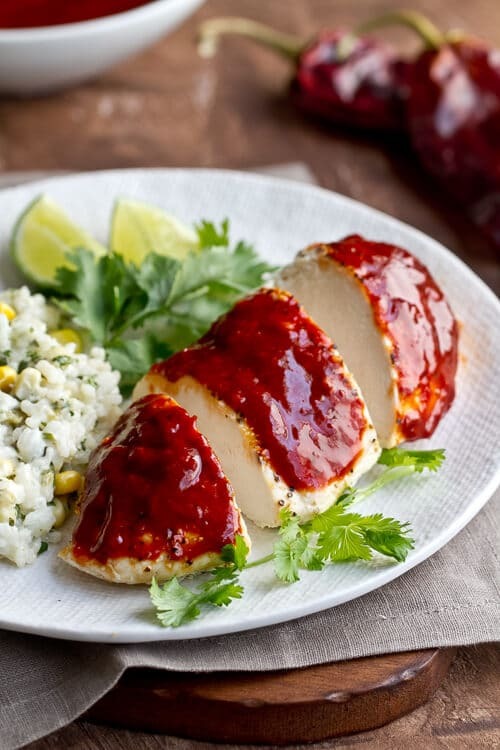 Hatch Chile Glazed Chicken made with dried Hatch chiles… definitely a “winner, winner chicken dinner”!! Sour Orange Juice, dried Hatch chiles, chicken stock and agave. 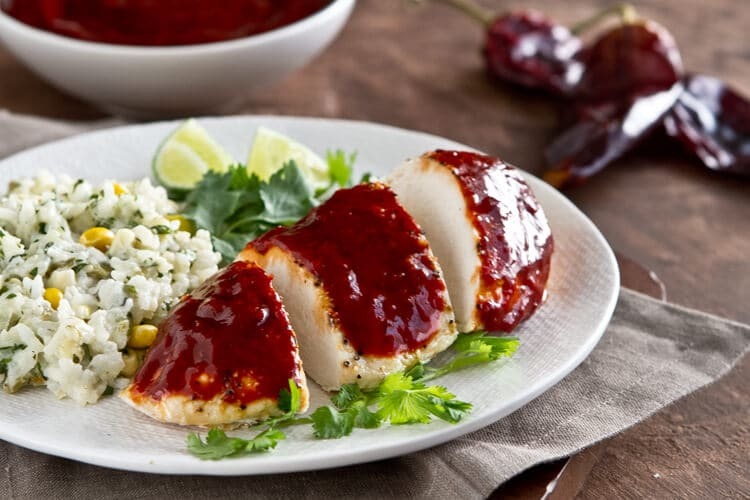 It’s sticky, spicy and a little sweet – and my new favorite chile sauce. 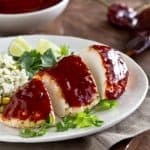 This Hatch Chile Glazed Chicken is great with just about anything – plain tortillas, corn on the cob or roasted potatoes – and the glaze would be amazing on pork, beef… and of course wings!!! Can you tell I really like this sauce??? But since I was in “Hatch heaven” though, I decided to serve it with one of my favorite rice dishes, this Chile Cheese Rice. Roasted chiles, fresh corn and cheese all mixed with rice and baked in the oven. I’ve been making this rice dish for years. It’s one of those dishes that’s always good and goes with just about anything – chicken, beef, pork or fish and can be assembled ahead of time. And you know how I feel about make ahead dishes!!! So that was pretty much a no brainer. So, now that I’ve whetted your appetite for Hatch chiles… here’s a handy list of Hatch chili roastings so you can go and stock up!!! And then come home and make this chicken and rice.. a match made in Hatch heaven!!! The Bitter orange juice aka Naranja Agria can be found in your local latin market or online. I like the Goya brand - it's fantastic in marinades, salad dressings, sauces and even cocktails! Add the chicken stock to a medium sized saucepan and add the chiles. Bring the mixture to a boil. Cover and reduce to a simmer. Simmer for 4 - 7 minutes until the chiles are soft and pliable. Let the mixture cool and then transfer to a blender. Add the bitter orange juice, agave nectar and cumin. Blend until smooth. If too thick, thin with a little extra chicken stock. Taste and season with salt and/or pepper. 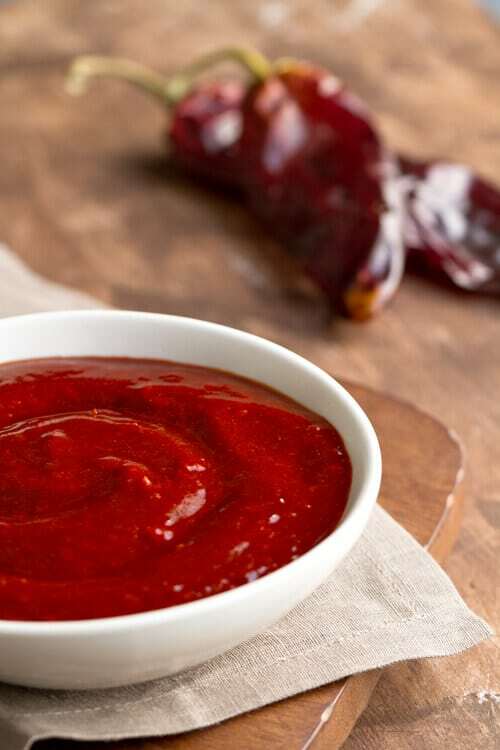 Transfer sauce to a bowl. Pre heat the oven to 400 degrees. Place chicken on a rack on a sheetpan. I line mine with foil for easy clean up! Brush the chicken with a little vegetable oil and season with salt and pepper. Roast chicken for 20 minutes. Remove chicken from the oven and spoon some of the chili sauce over. Return chicken to the oven and cook until the internal temperature reaches 165 degrees. Remove chicken from the oven and let rest for 5 minutes. 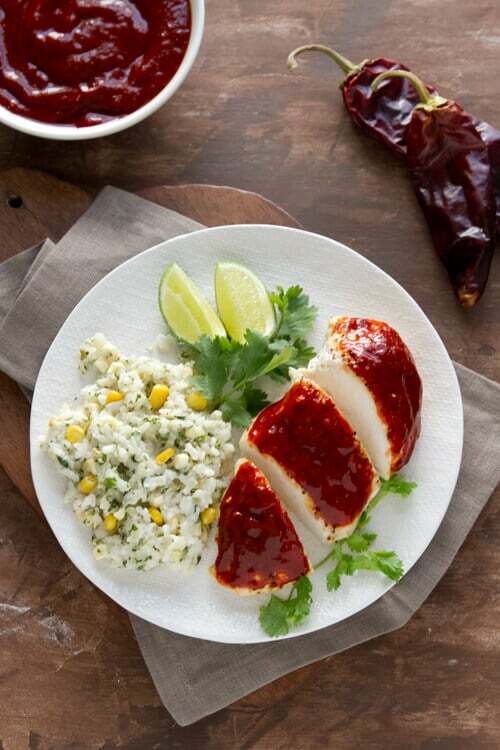 Slice chicken into 2 inch pieces and serve with the Chile Cheese Rice. with the extra chili sauce. I share your Hatch chile love. Soon the aroma will permeate the air as outdoor stalls start roasting them and selling them by the bushel. We’re lucky we’re so close to New Mexico and can find them EVERYWHERE! I am going to be on the look out for bitter orange juice. I love how you used fresh and dried hatch chiles in the same meal. Thanks Cathy!! The bitter orange juice is awesome… fresh obviously is better but in dishes like this, the bottled works well!!! YUM. My mouth is watering. You are amazing, Nancy! Awww… thanks Mary Ann!! The glaze is amazingly good and so simple to make. Definitely will be trying it on wings for football season!! Oh, red or green; red or green. I ask myself that often.As far as chleis go, I do tend to like green, but the red *color* is just so pretty that I order that sometimes, too.You didn’t mention the Christmas option! Or is that secret insider (native New Mexican) information? Oops. Oooh… didn’t think of Christmas but the dried hatch would be great for that!